Is your kiddo ready to get groovy this Halloween? Is he ready to spread peace and love all around the neighborhood when he goes out trick-or-treating? If you have a true flower child on your hands then we have just what you need. 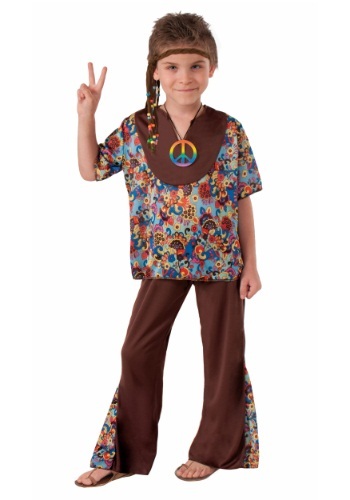 Check out this awesome Hippie Boy Costume! Once your little one tosses on these stellar threads he will be totally out of sight! The v-neck baggy top is more colorful than a rainbow and the brown pants have a matching floral print on the bell-bottoms. Your youngster will look as if he is some sort of time traveling hippie that just leaped forward from Woodstock with this easy to assemble outfit. Make that costume even groovier when you take a look through our collection of 60’s and 70’s themed accessories. Grab your little one a colorful peace sign necklace along with a trippy headband or bandana. Then once he slips his little feet into a pair of sandals his trippy transformation will be complete! You can help him have even more fun this Halloween when you teach him some of the lingo from they used all those decades ago. Once he looks like a hippie and sounds like a hippie people will have to believe that he must be a hippie. He’ll have the most convincing costume in town this year, not to mention tons of fun running around the block showing off his flower power. Give your little one the grooviest Halloween he’s ever had when you start it off with this Hippie Boy Costume!